^ Edmondson, Jacqueline. Condoleezza Rice: A biography. The United States: Greenwood Publishing Group. 2006: 22. ISBN 978-0-313-33607-2. ^ Billy Joel in Walk of Fame honour, BBC News, retrieved on 11 April 2015. ^ Monitor. Entertainment Weekly. May 10, 2013, (1258): 30. ^ Tallmer, Jerry (July 16–22, 2003). "Billy Joel grapples with the past", The Villager, 73 (11); retrieved December 7, 2008. ^ "Past students of Morton Estrin". mortonestrin.com; retrieved December 7, 2008. 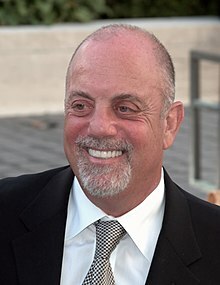 ^ Billy Joel: The Piano Man In A New York State Of Mind. KCBS-TV. December 17, 2013. ^ Billy Joel. classicbands.com. 2007 [October 6, 2008]. ^ Brozan, Nadine. Chronicle. New York Times. June 26, 1992 [August 19, 2011]. ^ Sony History: A Great Invention 100 Years On. Sony. [November 4, 2008]. （原始内容存档于2008年8月2日）. ^ River of Dreams album cover, retrieved on 11 April 2015.